Full sized seamless all steel body has a durable molded seat back with attached seatbelt. No scratch edges, extra long handle, molded wheels. Handle folds under for easy storage. No pinch ball joint keeps fingers safe. Controlled turning radius prevents tipping. Full sized seamless all steel body with no scratch edges. Child seat belt. Extra long handle for easy pulling. 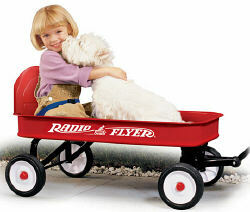 Wagon Body (Outer Dimension): 34" x 15.5" x 4"
Wagon Wheels: 7" x 1.5"